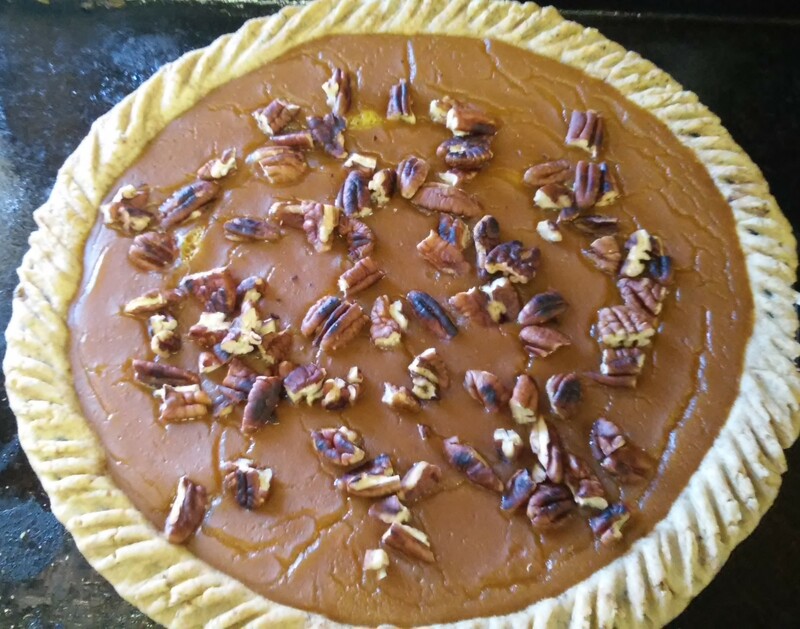 Thanksgiving is around the corner and so let us share a favorite – vegan pumpkin pie. Preheat oven to 350F and grab your favorite 9-inch pie dish. In a large bowl mix all the dry ingredients while humming to your favorite song. Next, add olive oil, soy milk, and brown rice syrup. Mix by hand until the dough forms into a few lumps. Do not over mix. The dough should be moist, but not too sticky. Some like to use a mixer and “pulse” the dough. I find it just as easy to do by hand and there is no mixer to clean afterwards. Place on a lightly floured surface and roll out the dough until it is a few inches wider than the pie dish. Place the pie dish on top of the dough and trim edges leaving about an inch around the edge. Gently roll the dough onto the rolling pin and then unroll over top of dish or just flip dough onto the dish however you want. Don’t worry if it breaks a little since you can just pinch it back in place. Using a fork, poke 12 holes in the base and press the fork around the sides to make the pattern in the edge of the crust. Pre-bake for about 12 to 14 minutes. Place pumpkin and water together in a pot. Gently warm the mixture over a low flame stirring constantly. As it heats up add the agar agar two teaspoons at a time continuing to stir until the flakes are completely dissolved. Add brown rice syrup, maple syrup, and any spices. Continue to stir as it comes to a very gentle boil. Boil for 1 to 2 minutes, then turn off flame and pour liquid into pie crust. If you have extra liquid that won’t fit in the pie crust, pour into a small bowl and you have a wonderful bowl of pumpkin custard. Bake at 350 for 10 to 15 minutes or so just to brown the crust a bit.